Bananas Foster French Toast makes a deliciously decadent breakfast! 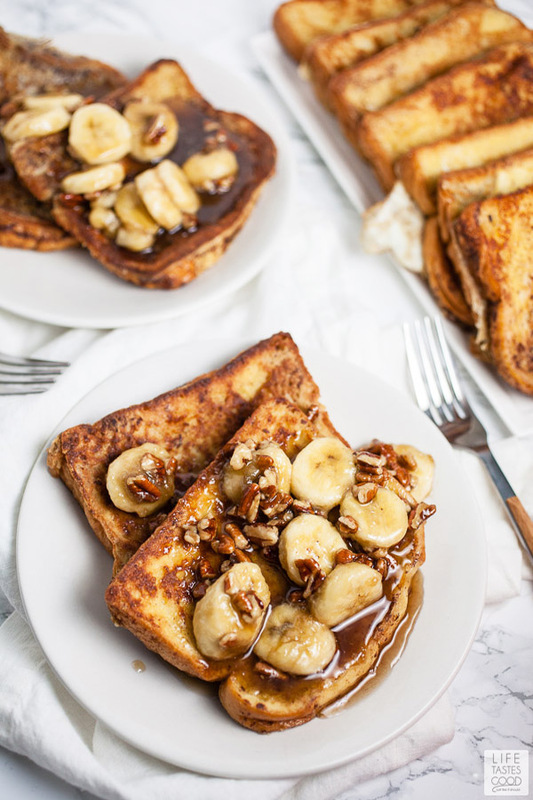 French toast topped with a sweet syrup glaze full of bananas and toasted pecans will wake up your taste buds deliciously! Bananas foster is a dessert that originates from New Orleans. It’s typically made with butter, brown sugar, cinnamon, bananas, and a liquor such as rum. Sometimes the rum is ignited and the dish is flambeed. Bananas foster is traditionally served over ice cream or as a filling for crepes but the great thing about it is that it’s incredibly versatile. Bananas foster makes a great topping for all kinds of desserts and breakfast items. 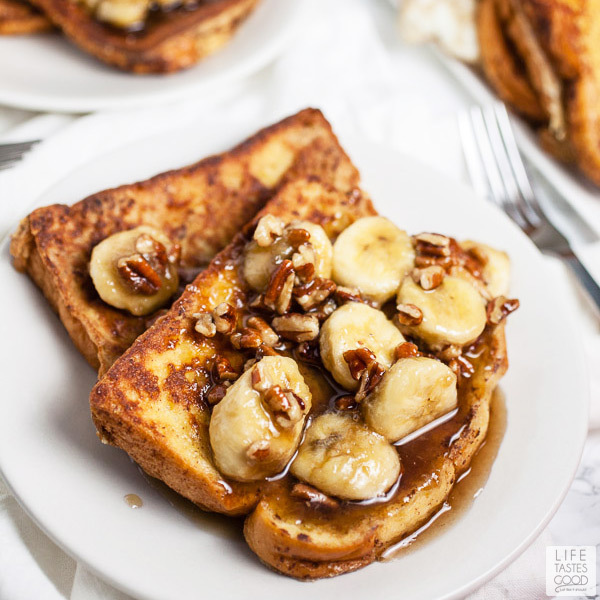 It lends a decadent flair to dishes like French toast and turns an everyday breakfast into a treat! I’m not a morning person, like, at all. But I love breakfast foods of all kinds. Especially the bread-y goodies like pancakes, waffles, and French toast. I’d be hard-pressed to pick a favorite among these items – They’re all delicious in their own way. French toast is definitely an easy dish to whip up. It’s quick and even the most basic version of it is awesome. Sometimes, though, it’s fun to kick things up a notch to make everyday dishes feel extra special and decadent. That’s where this Bananas Foster French Toast comes in. 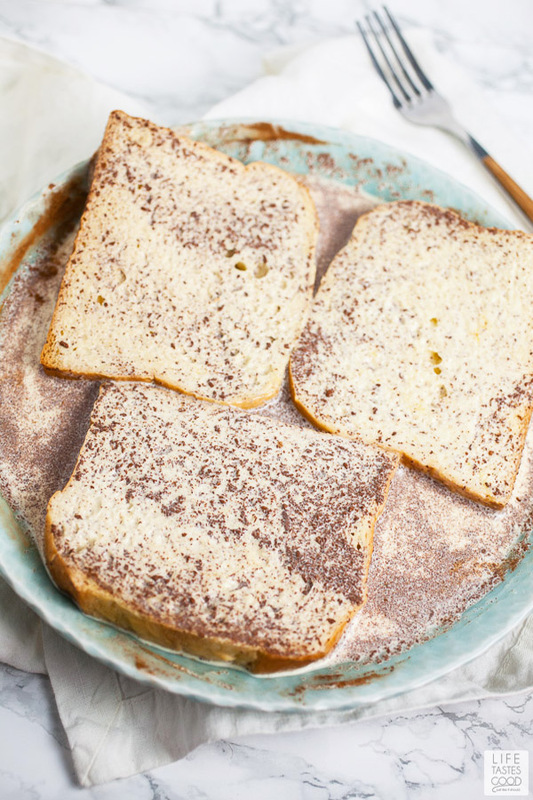 It’s got all the elements of a traditional French toast recipe – Bread, eggs, cinnamon, butter. But then it’s topped with a sweet syrupy glaze that’s full of caramelized bananas and toasted pecans. I’m telling you – French toast just reached a new level! The key to a fantastic French toast recipe starts with the bread. When it comes to the bread it’s best to ‘go big or go home’. Thin slices of multi-grain sprouted seed bread won’t do. The best bread for french toast is thick slices of brioche or challah bread. It’s best to let the bread dry out slightly before preparing the French toast so the bread slices soak up all that creamy egg goodness. Bread that is freshly baked or too soft tends to get soggy. Start by cracking 5 eggs into a mixing bowl and whisking them together. Add 1 1/2 cups heavy whipping cream (whole milk works great as well or use half cream and half milk) along with 2 tsp. of cinnamon. Whisk the mixture together and then pour it into a shallow dish. Place the slices of bread into the dish and turn them over to coat both sides. How many slices you add at a time depends on the size of your dish. The next step is to toast the bread and turn it into French toast. I like to use a heavy duty pan like a cast iron skillet but really any type of pan should work. And if you have a pancake griddle or something like that – Even better! Heat the pan to medium-low and add a pat of butter coating the bottom of the pan. You can also use a combination of oil and butter or ghee (clarified butter) if you can find it. The butter will give the French toast a nice caramelization and prevent it from sticking. Once the butter is melted, place the soaked pieces of bread in the pan and cook for 3-4 minutes per side or until it is slightly browned. You will likely need to complete this process multiple times depending on the size of your pan. Once the bread is toasted remove and set aside. Soak another batch of bread, add another pat of butter, and repeat the process until the entire loaf is toasted. 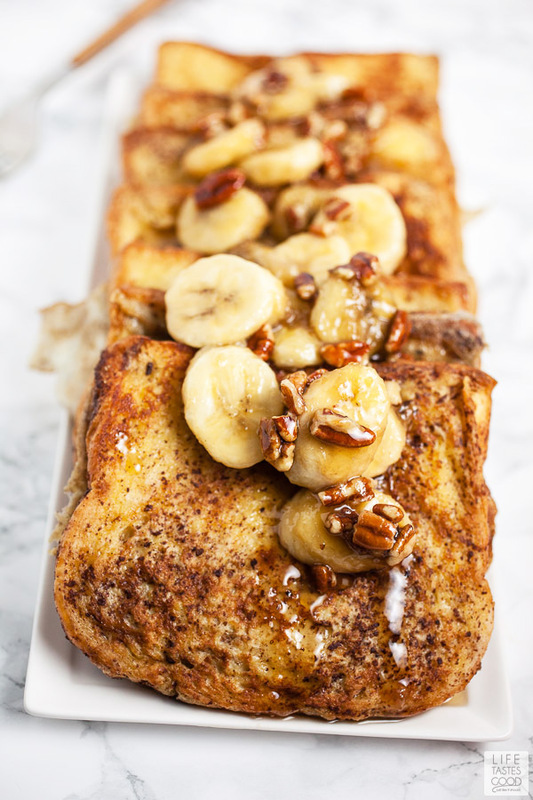 Now for the really good stuff – The bananas foster portion of this French toast dish. 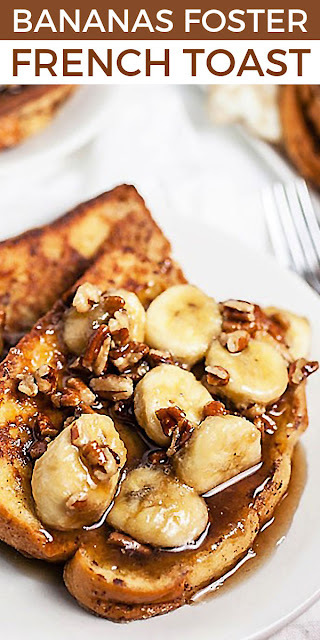 You can prepare the bananas foster topping while the French toast is cooking and breakfast will be ready at the same time. 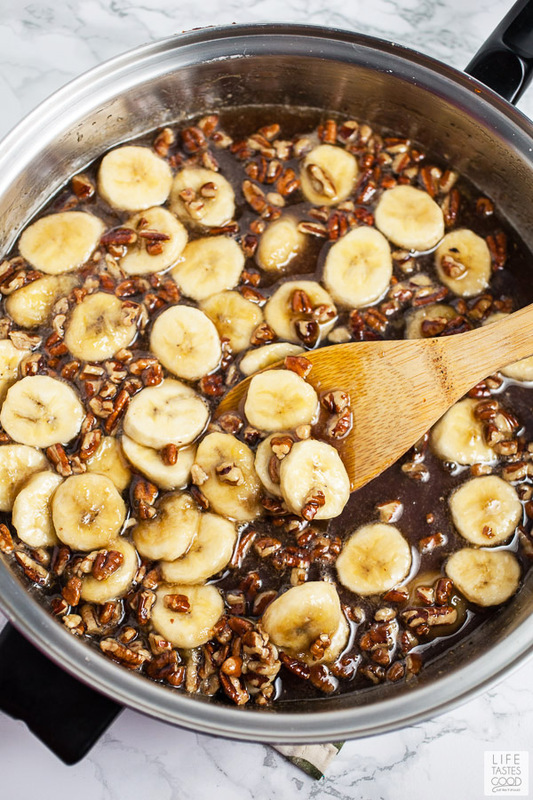 This syrupy glaze for the bananas foster consists of pecans, bananas, maple syrup, brown sugar, and rum extract. Begin by heating a pan to medium low. Add 1 cup of chopped pecans to the pan. Toast the pecans for 5 minutes or so, stirring occasionally. Do this before adding the other ingredients to release the nut oils and develop a more robust flavor. The next step is to add 1 cup of maple syrup along with 1/2 cup of brown sugar. Bring the heat to medium and cook for 1 minute or so. Cut 4 bananas into slices and add them to the pan along with 1 tsp. of rum extract and a pinch of salt. Stir the mixture and cook for another 2 minutes or so. Once all the bread has been toasted and the bananas are caramelized the dish is finished! The only thing left is to serve it. Heap as many slices onto a plate as you like and spoon some of the wonderful bananas foster sauce over the top. You can add as much or as little of it as you like. There’s nothing like those slices of toasted bread topped with a sticky sweet syrup. Grab a cup of coffee and you’re all set! Most home cooks will already have many of the tools needed to make this recipe, but for your convenience I've listed the tools I use when making Bananas Foster French Toast. Just click on the item name and find the product I use on Amazon. Disclosure: Life Tastes Good is a participant in the Amazon Services LLC Associates Program, an affiliate advertising program. Please note: The following links are affiliate links to products I use and love. Crack 5 eggs and add them to a mixing bowl. Whisk them together. Add 1 1/2 cups heavy whipping cream (or whole milk) and 2 tsp. cinnamon to the eggs. Mix together completely. Pour the egg mixture into a shallow dish. Place as many pieces of brioche or challah bread as will fit into the dish. Turn them over to completely coat on both sides. Heat a skillet or griddle to medium low. Add a pat of butter and completely coat the surface with the butter (can also use oil and butter or ghee). Place as many pieces of the coated bread in the pan and toast for 3-4 minutes on each side or until they are lightly golden. 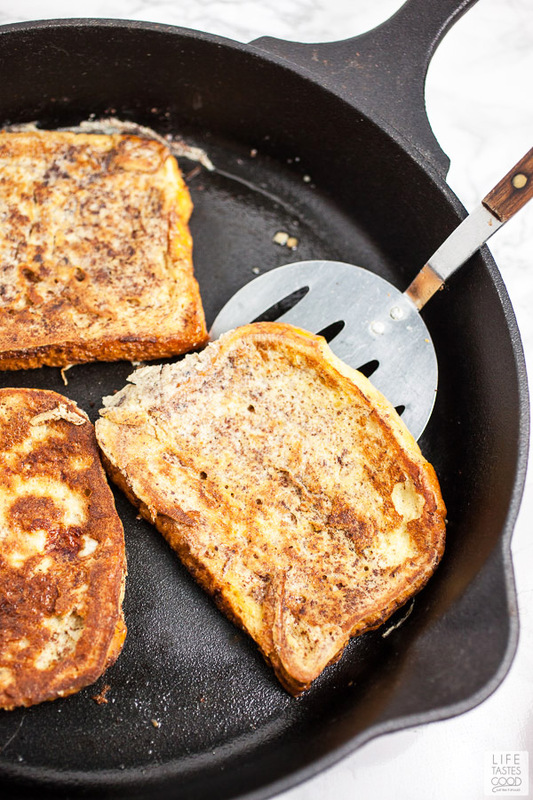 Remove the French toast from the skillet and keep warm. Coat another batch of bread in the egg mixture. Place another pat of butter in the pan and coat the surface. Toast the second batch of bread and repeat this process until the whole loaf is toasted. Heat a skillet to medium low. Add 1 cup of chopped pecans to the skillet. Toast for 5 minutes or so, stirring occasionally. Add 1 cup of maple syrup and 1/2 packed cup brown sugar to the skillet. Bring the heat to medium and stir the mixture together. Slice 4 bananas and add them to the skillet along with 1 tsp. rum extract and a pinch of salt. Allow the mixture to simmer for another 2 minutes or so. Make sure all the bananas are coated in the syrup and slightly caramelized. Serve the French toast. Spoon as much or as little of the syrup mixture over the French toast as you like. Recipe adapted from Paula Deen's Bananas Foster French Toast Recipe. Nutrition label disclaimer: Nutrient values are estimates only. Variations may occur due to product availability and food preparation. To obtain the most accurate representation of the nutritional information in a given recipe, you should calculate the nutritional information with the actual ingredients used in your recipe, using your preferred nutrition calculator. You are solely responsible for ensuring that any nutritional information provided is accurate, complete, and useful.